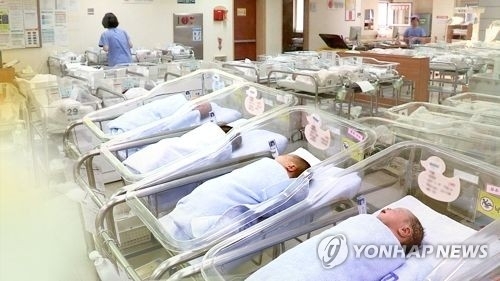 SEOUL, July 5 (Yonhap) -- South Korea's total fertility rate is likely to hit a record low this year, a presidential committee warned Thursday, prompting the government to take a series of steps to boost the country's chronically low birthrate. The total fertility rate -- the average number of children a woman bears in her lifetime -- is expected to fall below 1.0 in 2018, down from 1.05 a year earlier, said the Presidential Committee on Aging Society and Population Policy. The figure is much lower than the replacement level of 2.1 that would keep South Korea's population stable at 51 million. The committee said the number of babies -- either born or to be born in 2018 -- is likely to reach 320,000, down from 357,700 in 2017. It also warned that the number of babies born could fall below 300,000 before 2022 if the current low birthrate persists. On Thursday, the government unveiled a set of measures worth about 900 billion won (US$804 million) to boost the low birthrate. One of the measures is designed to lessen women's burdens in childbirth and child rearing as a growing number of South Koreans have fewer babies, due mainly to financial constraints amid prolonged economic uncertainties. Many South Korean women complain that their careers can suffer if they take time off for childbirth, as it is not easy for them to find jobs after spending an extended time away from work. In 2015, South Korea's female participation rate in the workforce stood at 57.4 percent, compared with the average of 66.8 percent of member states of the Organization for Economic Cooperation and Development. The committee said the government will lower medical treatment costs for expecting mothers and one-year old babies while strengthening childcare services. The government will also ensure parents who have children younger than 8 years old can take one hour per day off work for up to two years without a cut in their wages, according to the committee. The latest moves come as South Korea's population is rapidly aging. In 2017, the number of South Koreans over 65 accounted for 13.8 percent of the population. That number is projected to grow to 26.1 percent of the population by 2032 and 41 percent by 2060, according to Statistics Korea. A country is classified as an "aged society" if people over 65 make up 14 percent of the population. If the numbers top 20 percent, the country is deemed a "super-aged society".